Ernie Johnson Jr. has been in the game a long time. With one of the most recognized voices in sports broadcasting, he is a tireless perfectionist when it comes to preparing and delivering his commentary. Yet he knows that some of sports' greatest triumphs--and life's greatest rewards--come from those unscripted moments you never anticipated. 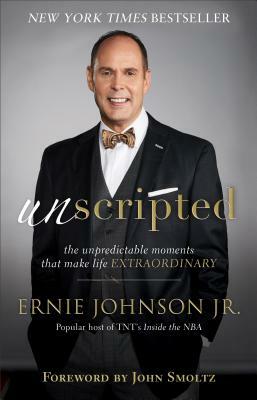 In this heartfelt, gripping autobiography, the three-time Sports Emmy Award-winner and popular host of TNT's Inside the NBA provides a remarkably candid look at his life both on and off the screen. From his relationship with his sportscaster father to his own rise to the top of sports broadcasting, from battling cancer to raising six children with his wife, Cheryl, including a special needs child adopted from Romania, Ernie has taken the important lessons he learned from his father and passed them on to his own children. This is the untold story, the one Ernie has lived after the lights are turned off and the cameras stop rolling. Sports fans, cancer survivors, fathers and sons, adoptive parents, those whose lives have been touched by a person with special needs, anyone who loves stories about handling life's surprises with grace--Unscripted is for all of these. Ernie Johnson Jr. is a three-time Sports Emmy Award winner and host of TNT's Inside the NBA with Charles Barkley, Kenny Smith, and Shaquille O'Neal. He is the studio host for NBA TV's popular Fan Night and a studio host for Turner and CBS's NCAA Division I Men's Basketball Championship coverage. He is the lead play-by-play announcer for Turner's coverage of Major League Baseball and the PGA Championship, and has also covered the National Football League, The British Open, Wimbledon, and the Olympics. In 2007 Johnson was presented with the first-ever honorary John Wooden Keys to Life Award, presented by Athletes in Action, which is awarded to individuals who exemplify Wooden's -Seven Keys to Life, - including character, integrity, and faith. In 2015 he was recognized with a Musial Award, presented in honor of Stan Musial's legacy by celebrating iconic -good sports- and the year's greatest moments in sportsmanship. In 2016 his alma mater, the University of Georgia, honored him with the Grady College of Journalism John Holliman Lifetime Achievement Award as well as the Bill Hartman Award for Lifetime Achievement from the UGA Athletic Department. Johnson lives in Braselton, Georgia, with his wife, Cheryl, and their six children, four of whom are adopted.